Most contractors think that their reputations for quality work and exceptional service should lead to many referrals and plenty of work. Many don’t have a budget for marketing or sales, while others don’t consider customer relationships important enough to develop a system for building loyal customer relationships. They wait for customers to call, pick up plans, bid cheap and hopefully win enough work to keep busy. This old-school construction business model hasn’t worked for years, but contractors continue to offer low prices to fill their sales pipeline as their only sales system. How do you ensure your sales pipeline stays full of profitable projects proposing against only a few qualified competitors at high margins? The sales strategy of successful construction firms is not to sit and wait for the phone to ring. They have a proactive business development system that attracts continuous customers and preferred targets, maintains solid customer relationships and spreads the word that they are the best at what they do. To start building a steady sales pipeline, first determine how much money you need to earn monthly and annually to grow your company. 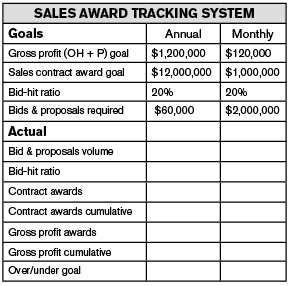 Ddetermine the sales you need to hit your goals using a sales award tracking system spreadsheet that outlines the bid, proposals, bid-hit ratio (number of bids versus awards won) and award volume they need monthly and annually, for example. After determining the sales and gross profits you need every month, decide what kinds of projects and customers you want to target. Without a focus, it’s difficult to improve your sales results. Contractors who struggle with profitable sales tend to do any job, any size, anywhere, for anyone. Because they are not focused on one or two project or customer types, they can’t develop a steady sales pipeline. Which types of customers provide the greatest potential for developing an ongoing flow of high-margin work? Which are the project types, job sizes, locations and contract award methods with the most potential? By concentrating on only a few customer types or markets, you can build a reputation as an expert in that type of work. Plus, customers are easier to find if you know who you want to target. In order to keep the sales pipeline full, you must have customer targets to market and sell to on a regular basis. Make a list of your existing customers and new customers you hope to do business with in the future, including top loyal customers, repeat customers, past customers, new customer targets and new market targets. Now that you have a customer target list, create a sales activity calendar. Start with the low-hanging fruit or customers you already know. Determine how you can get them to hire your company more often than they have in the past. For each top, repeat or past customer, develop a plan of attack. Decide which sales activity will work for each to improve the bid-hit ratio. Include the specific sales activities for each target and how often you will pitch them (minimum of three times per year per customer). Sales activities can include lunches, ball games, industry dinners, golf outings, mailings, gifts, presentations, etc. Keep track of your sales pipeline activities every month in your regular business development meeting. Contractors are often so busy working on building their projects that their estimating, bidding and sales activity becomes second priority. However, when you neglect the business aspect of your job, you will have a hard time winning profitable work. Profitable construction business owners dedicate almost 50 percent of their time to winning work, not doing work. They hold monthly business development strategy meetings, review their sales and results, focus on building customer relationships, make weekly sales calls and establish their company’s marketing plan. They also focus on potential, future, current and recent proposals, estimates and bids. Most important, they concentrate on proactive follow-up after submitting each and every bid and proposal. 1. Review estimating, proposal and bid schedule, including potential projects to bid, propose and estimate; current jobs estimating/bidding; and bid and proposal follow-up activity. 2. Schedule weekly loyal customer activities. 3. Review weekly sales call action plan. 4. Develop weekly customer target action plans. 5. Review and plan future sales opportunities. 6. Commit to new customer target activities. 7. Plan upcoming marketing activities. By committing to regular business development activity, your company will find better customers and higher margin work.